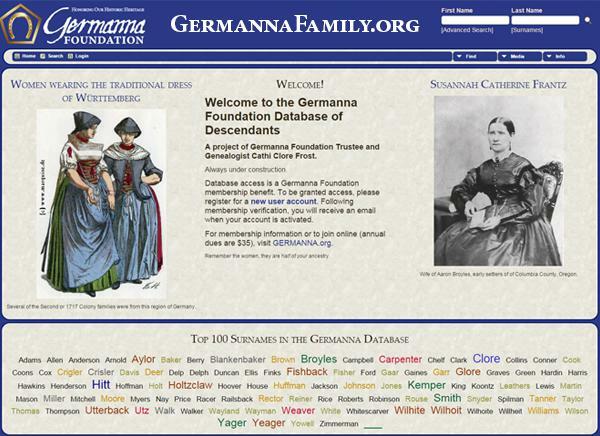 The Germanna Foundation has a new data-rich genealogy website database of Germanna descendants at GermannaFamily.org. The database is a project of Germanna Foundation Trustee and Genealogist Cathi Clore Frost. To access the database, you must be a paid member of the Germanna Foundation (Become a Member/Renew Your Dues securely online). Annual membership dues are only $35 per year or $45 for a family. Then you register for a new user account on GermannaFamily.org and you will receive an email when your account is activated.